Hyper Japan 2012 Christmas, the fourth outing for the U.K.’s biggest celebration of culture and cuisine, took took place on the weekend of 23rd-25th November 2012 in London’s Earl’s Court. 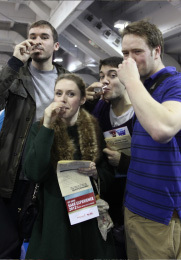 As part of its activities, Eat-Japan’s popular food and drink area at the event included an exclusive Japanese sake-tasting demonstration , the “Sake Experience 2012”. This was a big success, with a grand total of 665 people having attended by the time the curtain dropped at its close on the third day. The aim was to convey the enjoyment of tasting sake through the four experiences of “Try, Learn, Vote and Buy”, with ten brewers coming to London from all over Japan, from Iwate in the north all the way down to Kagawa in the south; they brought between them a variety of twenty-one different sakes, such as sparkling, unfiltered(muroka), undiluted (genshu) and aged (koshu), and presented them at a range of temperatures and in different styles, such as heated, chilled, on the rocks and so on. In addition to all this, Natsuki Kikuya, Head Sake Sommelier at London restaurant Roka, held over the course of the weekend a number of mini-lectures in which she brought all the participants’ enjoyment of sake yet another step further, by demonstrating such things as how to prepare and drink varying types of sake hot. After finishing all the sake-tasting, a popularity poll was held whereby the participants graded the brewers’ ten main products. The results were as follows: the “People’s Choice” was Asahi Shuzo of Yamaguchi Prefecture’s junmai daiginjo, “Dassai 23”, whilst Gifu Prefecture’s Hayashi-Honten picked up the award for “Best Sake Gift” for its “Golden Amber” koshu. Lastly, Sho Chiku Bai Shirakabegura, from Hyogo Prefecture, saw their “Sho Chiku Bai Shirakabegura Kimoto Junmai” dubbed “Best Matching with British Food”. Following the tasting, visitors were able to buy the sake they liked most at the Eat-Japan Shop, which sold, over the three days, a combined total of 500 bottles; many were pleased to be able to have an alternative, refreshing option for Christmas presents! 1.Dassai 23 / Asahi Shuzo, Yamaguchi Pref. 2.Junmaishu Urakasumi / Urakasumi Sake Brewery, Miyagi Pref. 3.Okuden Kantsukuri / Masumi Premium Sake, Miyasaka Brewing, Nagano Pref. / Kawatsuru Sake Brewing, Kagawa Pref. Sho Chiku Bai Shirakabegura Daiginjo Muroka Genshu / Sho Chiku Bai Shirakabegura, Hyogo Pref. 7.Maibijin Junmaishu / Mikawa Syuzoujyou, Fukui Pref. 9.Nanbu Bijin Tokubetsu Junmai, Nanbu Bijin Junmai Ginjo Gin Ginga, Nanbu Bijin Okenotami / Nanbu Bijin, Iwate Pref. 10.Goden Amber, Hyaku-Ju-Ro Extra Dry Junmai –Red Face-, Eiichi Yamahai-Junmai / Hayashi Honten, Gifu Pref. A delicate, juicy nose of fresh florals, peach and honeydew, moderate acidity faultlessly balancing smoothness and sharpness with a long finish. Delicious with scallops ceviche or carpaccio. 12 years in tanks and oak barrels give this koshu (aged sake) its eponymous, warm colour and sweet, spicy aroma; a perfect companion to desserts, cheeses, foie gras, roast lamb. The lactic acidity emblematic of the traditional kimoto technique imparts a banana and candy nose and a smooth sweetness on the palate, perfect for main courses, deep-fried food and cheeses.